Now that we can share our photos, let's see your bullseye guns. Here is my Keefer Custom, Aimpoint dot scope, with one of my better very best targets. The Colt was a used gun and the trigger was set up with a nice roll at about 3lbs, that's why I'm using it for the .22 Marvel Upper. 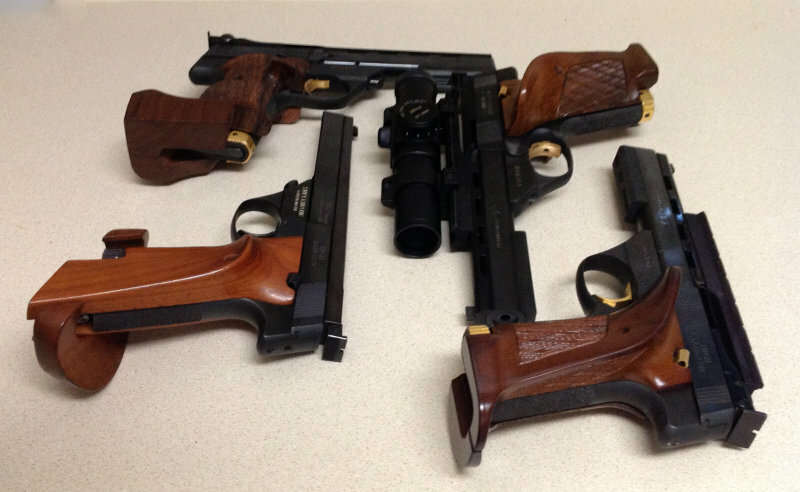 The Les Baer were all new (Premier II missing from photo), the hardballer's trigger was a little gritty but after 1,500 rounds and at least 1,000 dry fires it has a nice crisp break to it. I'd prefer a good roll trigger like the Colt so I may send all the Baers out for trigger work. Don't get me wrong they are exceptional crisp breaking triggers out of the box, well after break in anyway. Finally have some pistols to show off.. Sorry... not much of a poster, but I wanted everyone see my new "twins." I had Lou Biondo of Business End Customs (Peabody, Mass.) build these for me. He has a great reputation here, and he certainly didn't disappoint me with these. 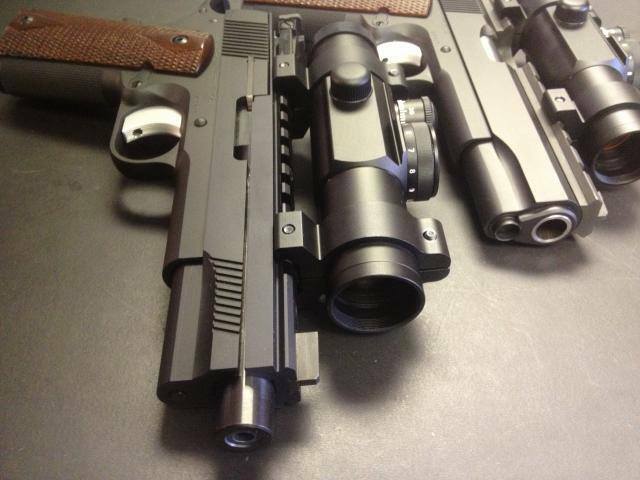 For the base of both guns, he started with sequential Caspian frames, and hand built them up. 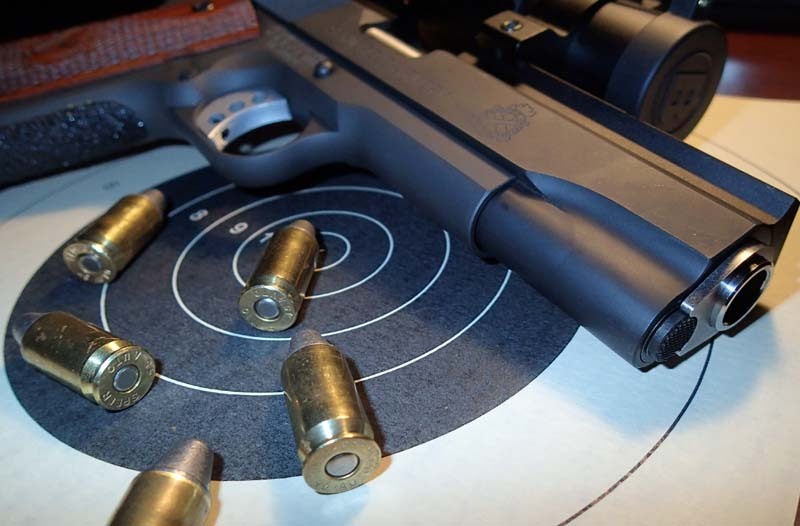 He installed roll triggers to just above NRA regulation weights, and they feel phenomenal. 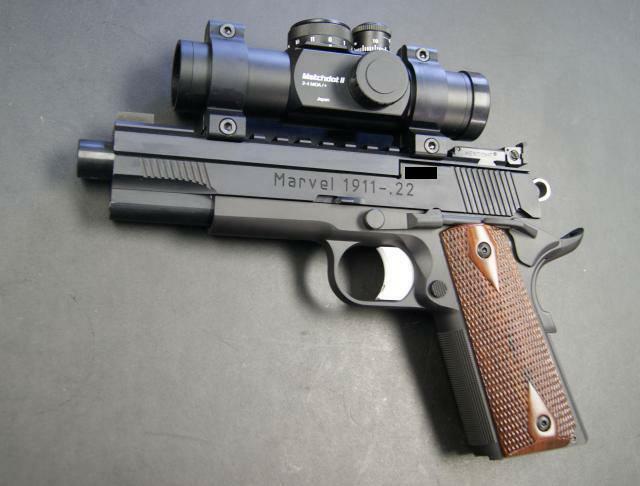 For the 22, the upper came from Marvel Precision as a complete unit, but Lou did the rest. 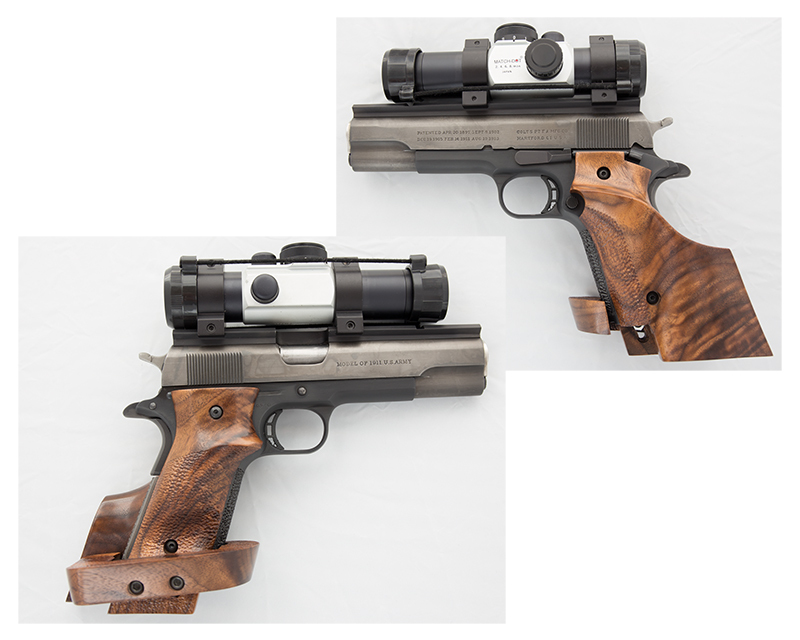 Since my eyes are not as great as they should be, he installed 2 identical red dot scopes on both, adding a special rail system for the .45. The fit and finish is exacting in all details. If you want more of the intricate details, I recommend talking with him directly. The "studio" style pictures are ones that he took (my camera is not nearly as good), and there's a few more on his Facebook page. The attached target picture was mine, though. After I fiddled with it, those were the 1st 3 shots I took off a rest. The 22 is just as accurate. Now if I could only shoot better than the guns! 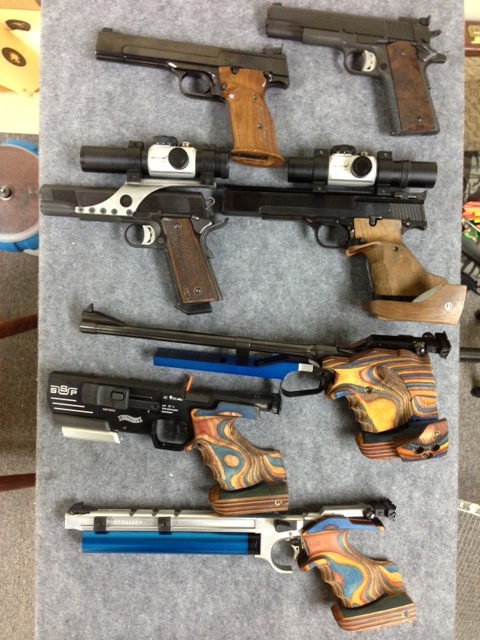 So here is my group of various bullseye pistols. 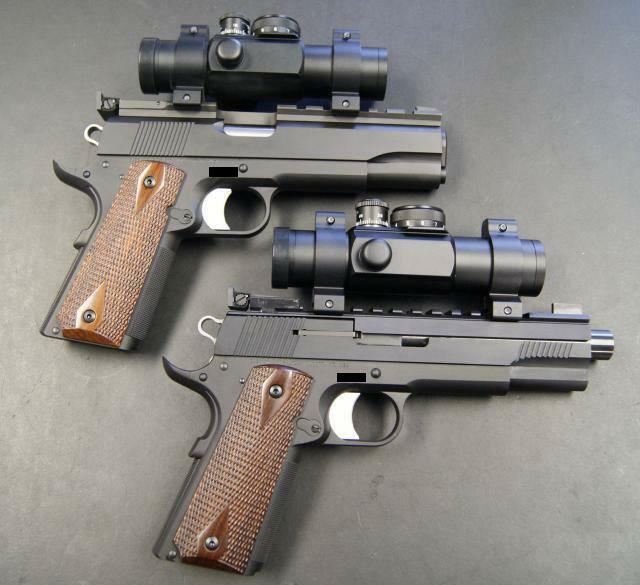 High Standard group - Top - SH Victor with Vitarbo grips; Right - two identically tuned and configured SH Military Victors with Sile grips; Lower Left, is a Clark Custom Tournament 106 Military with Herrett grips rebuilt by Jim Clark Sr.
.38spl wadcutter from .38 Super. 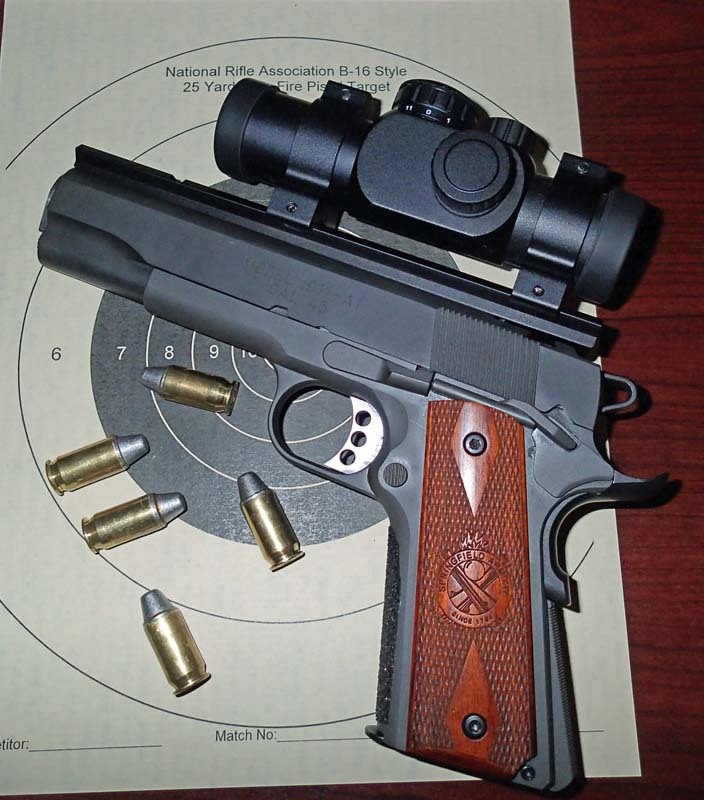 Larry Lang wrote: .38spl wadcutter from .38 Super. I'll Play... My first post will be the first built bullseye gun I ever bought. 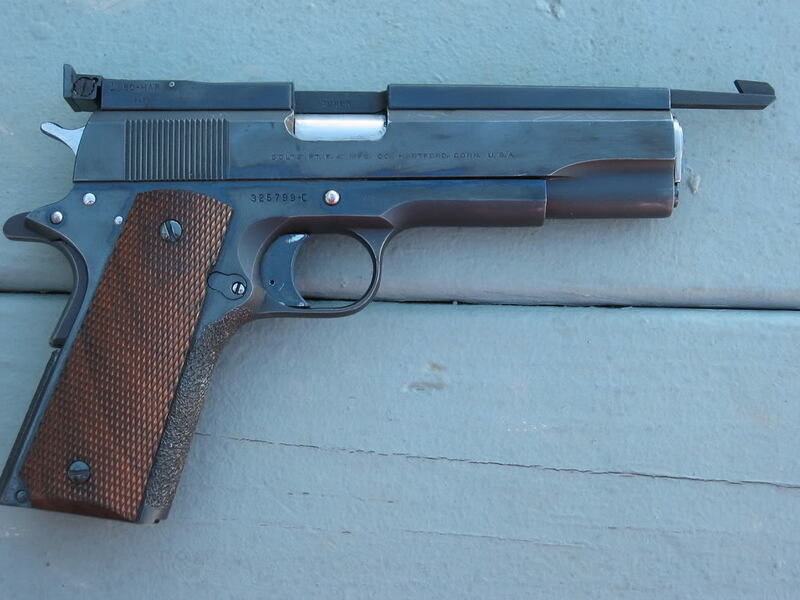 A pre series 70 commercial Colt, it was originally built by the old Air Force Pistolsmith Forest Davis when he first retired and still lived in San Antonio Texas. 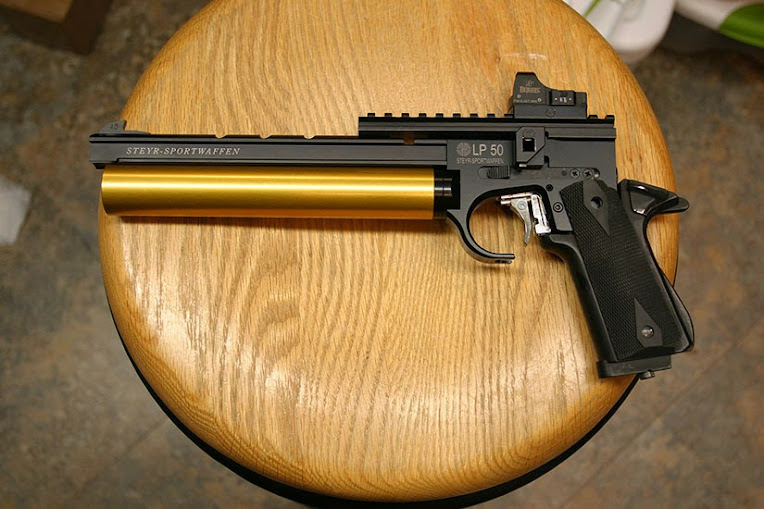 It has a Colt NM barrel and bushing. I acquired it in '78. 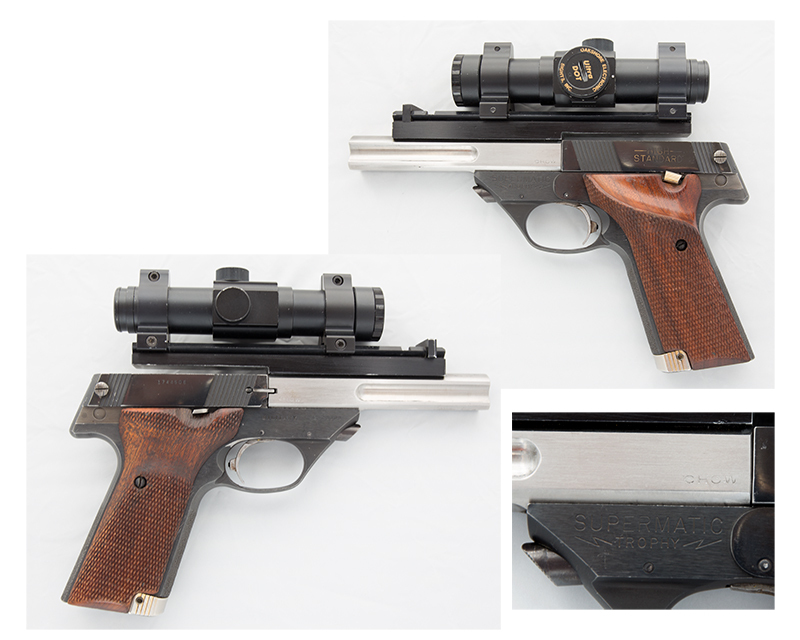 In the early 80s the original Joe Chambers, National Guard MTU Pistolsmith, mounted a Burris scope on the slide for me. In the Mid 90s Dan Norwood, National Guard MTU Pistolsmith, checked it out good and mounted a Bomar rib. The flat mainspring housing that came on the gun has the address of Forest Davis' shop in San Antonio TX on the back. My number 2 will be a full house Clark High Standard. The serial number makes this one a Hamden High Standard. Barrel wears the old Shreveport LA address. Sports a Bomar rib on a slab sided Douglas barrel. Unlike the barrel only jobs, this one has received the full Monte. The front and back straps wear Clark's signature "tiger tooth" stippling. The frame has an added screw that adjusts the trigger take up too. 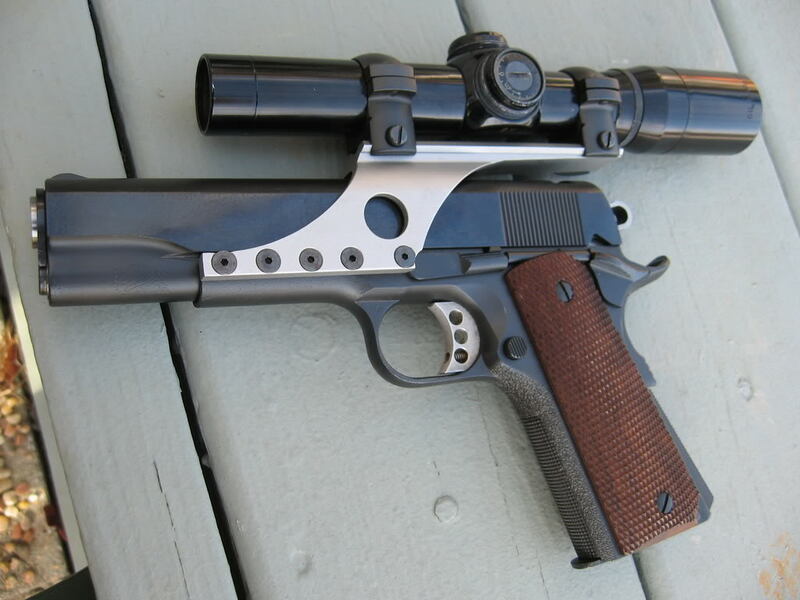 My current preference for 38 Super and 45 ACP paper punchers includes Gil Hebard Burris scopes, dustcover scope mounts, long triggers, wedge mainspring housings, beavertail grip safeties, and kart barrels. 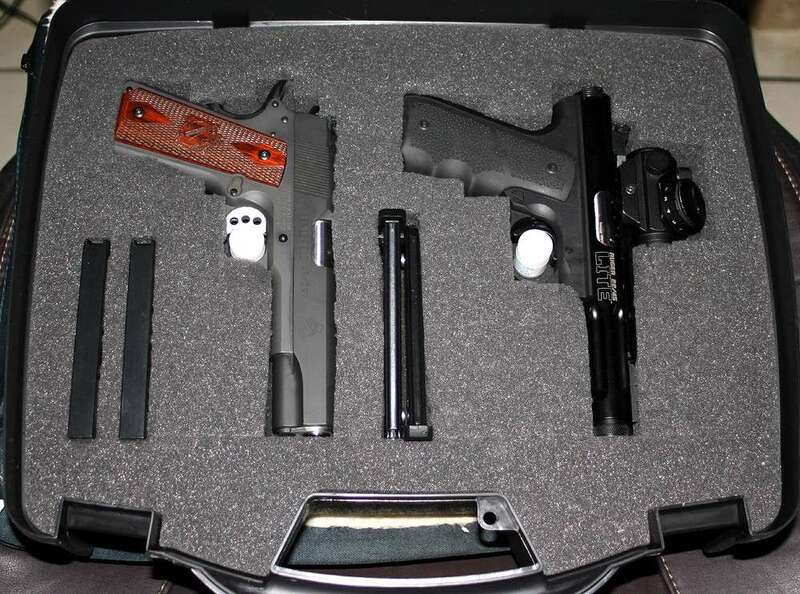 Colt and Springfield raw material. 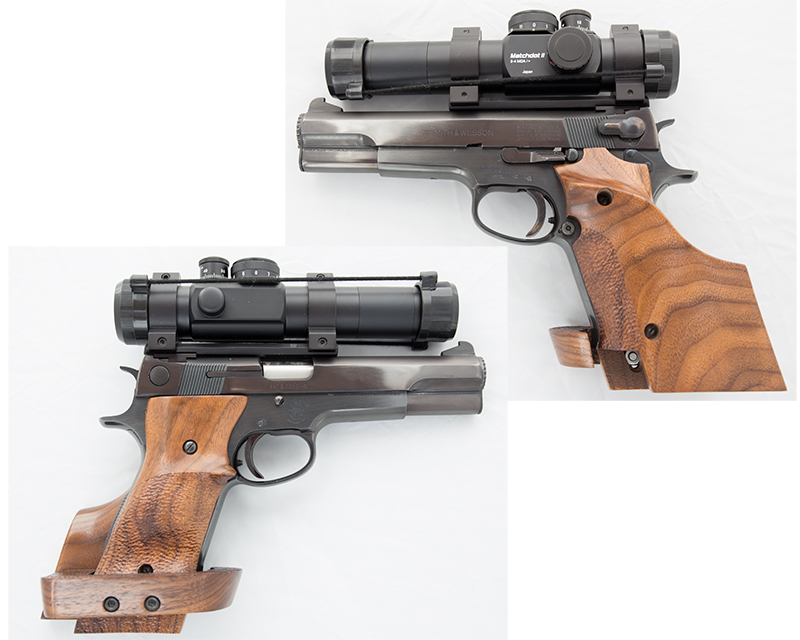 All Dan Norwood built..
Can't forget the Service Pistol hardware. Although Distinguished and retired I figured I'd better have one for just in case. 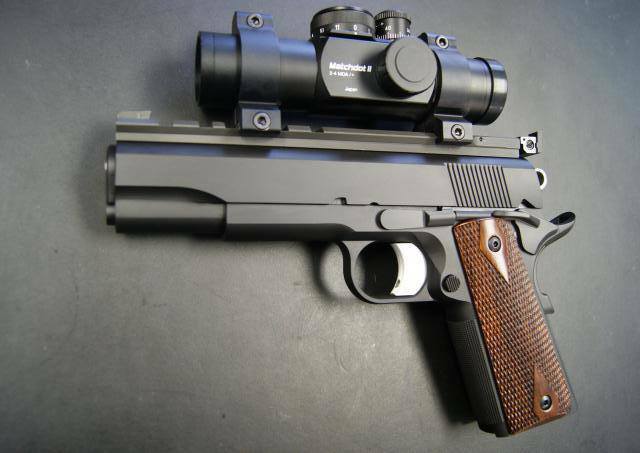 Caspian frame, NM slide, Barsto barrel, Bomar sights, and again built by Dan Norwood. My newest... Walther GSP-C. Hoping it will inspire me to compete again.. 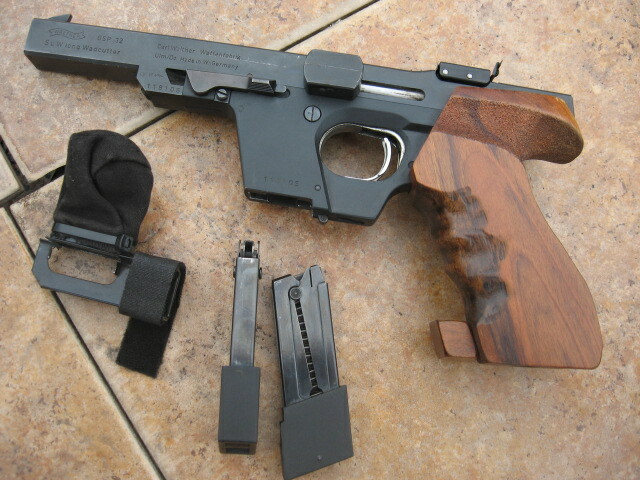 I found a great deal on a this used Steyr LP50, 5 shot air pistol, for indoor sustained fire training this winter. 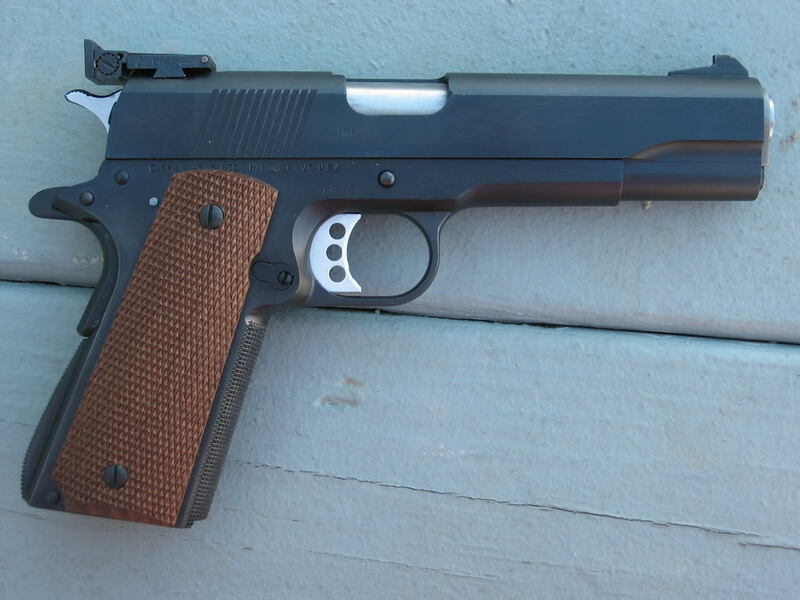 It came with the 4lb trigger option and the 1911 grip plus the standard grip. I ordered the dot mount from Pilkguns and added a spare Fast Fire which will be replaced with a Matchdot II to match what I shoot in competition. Right now I'm practicing on my 10M AP targets and keeping everything in the black. I'll have to figure out how to reduce some 50ft targets down to the 10M distance. I'm using the iPhone Bullseye APP for timing. Good looking setup. Did Bob do the work for you? HUGHT wrote: Good looking setup. Did Bob do the work for you? Yes, Bob D&T'd the slide and mounted the Clark rail. 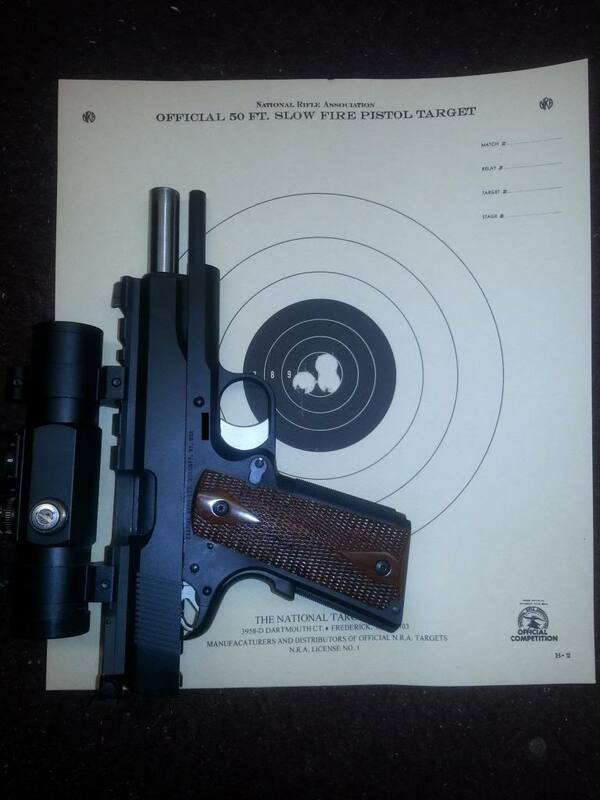 Hope to get it zeroed this weekend weather permitting. I changed out the mainspring and housing. Here is a new gun for me. A dedicated wad gun. I picked up a few points over my hardball gun. 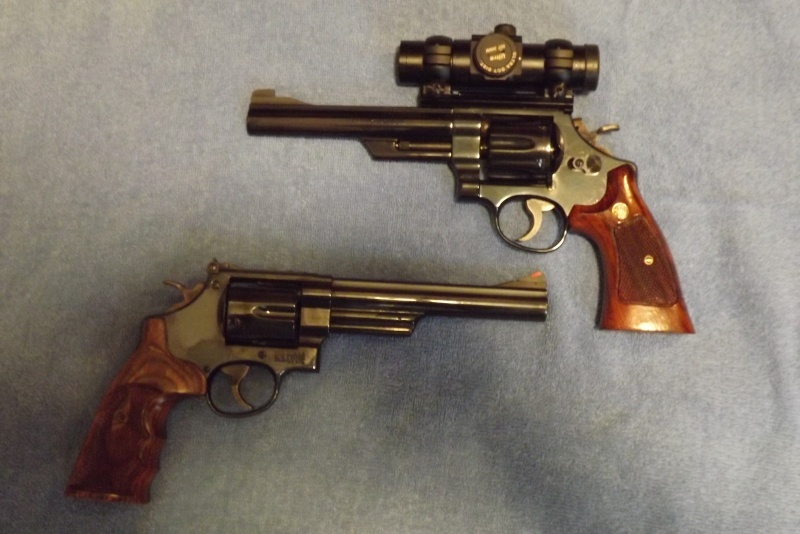 Ruger Mark III 22/45 Lite and Springfield Range Officer. Out here on the West Coast, we had the pleasure of having the late F. Bob Chow share his expertise on shooting as well as his skill as a gunsmith. Bob was the first Asian American to represent the United States in any Olympic Competition. 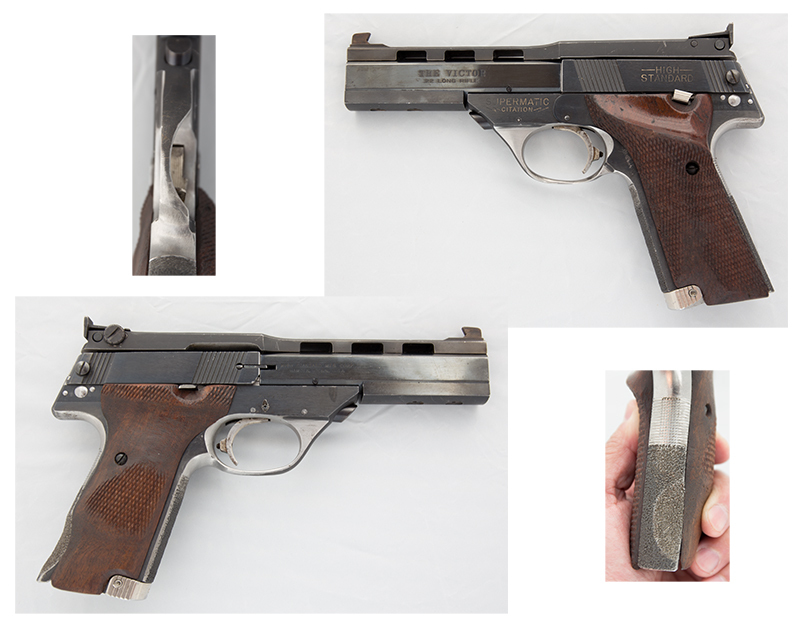 This was one of his personal pistols. For himself, we has definitely "function over form". He carved away a portion of the trigger guard. The screws at the rear of the slide made for a very handy addition. As was the adjustment screw he added over the trigger. And the reshaping of both the backstrap and right grip panel fits me like a glove! 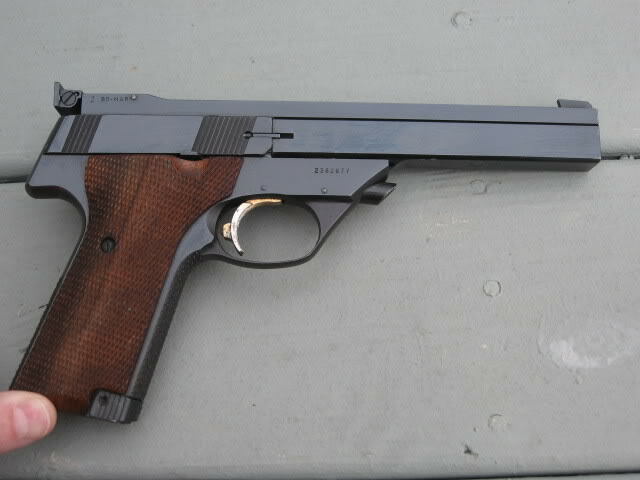 This is the pistol that Bob made for his late wife Bobbie. He made it as light as possible per her request. I hope I have figured this out and can post some pictures finally. 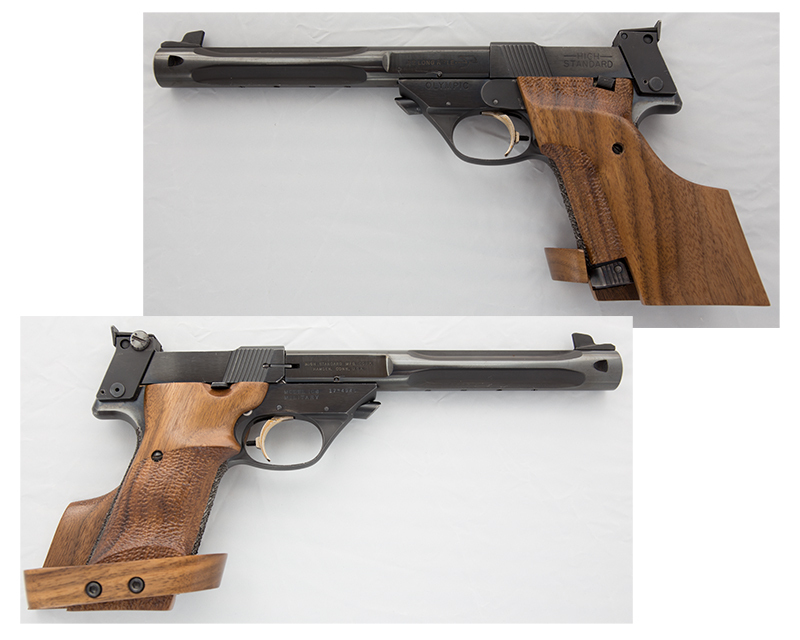 Picture 1 is of my two favorite Reeves Pistols.I shoot the 25-2 when I want to have a chance of winning and the 29 (very reduced 44 special load) when I am just using the match for practice.